Humans are obligate cooperative breeders, relying heavily on support from kin to raise children. To date, most studies of cooperative breeding have focused on help that supplements rather than replaces parental care. Here we propose that fosterage can act as a form of dispersed cooperative breeding, one that enhances women’s fitness by allowing them to disinvest in some children and reallocate effort to others. 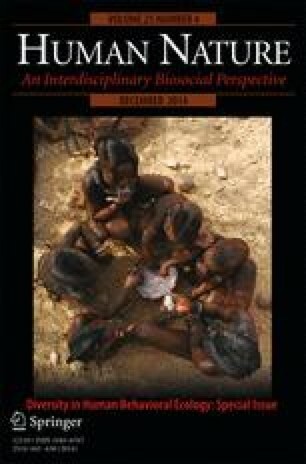 We test this hypothesis through a series of predictions about the costs and benefits of fosterage for mothers, foster parents, and foster children using data from the Himba, a group of Namibian agro-pastoralists. We show that fostering out children enhances mothers’ fitness, and we provide evidence for a causal link from fosterage to enhanced fitness by showing that fosterage of early-born children is associated with greater maternal reproductive success. Foster parents minimize the costs of fosterage by skewing their care toward their postreproductive years, and by mainly fostering close kin. However, the system is associated with some detrimental effects on foster children, who are more likely to be stunted and underweight than their non-fostered counterparts. We would, first and foremost, like to thank the Himba familes who participated in this research for their cooperation, patience, and hospitality. We would also like to thank Kemuu Jakurama (1976–2012), whose local knowledge and expertise were essential to this research and whose warm heart and good humor made the fieldwork so much more fun. BAS would also like to thank Michael Bollig, who first alerted me to the prominence of the fosterage system among the Himba, and Steve Josephson, who provided indispensable support during my initial trip to Namibia. This work was generously funded by the Wenner Gren Foundation and the UCLA Center for the Study of Women.